As the Starks utter relentlessly in Game of Thrones, “winter is coming.” But before that seeminglyunending season hits, perhaps it’s best for you to spend all of your hard-earneddough on the last dregs of summer at any one of these regional music festivals.A car (or private jet) is necessary to get to all of them, but if you bringalong some of your best friends, memories from these events should be enough towarm you through next April. Many of these groups are lesser known, but still absolutelyworthwhile checking out. In its 12th year, Total Fest is an all-volunteernonprofit festival that strives to bring in an insane amount of not-quite-famous actsto downtown Missoula. The event is spread out across multiple venues in theheart of the city and is all-ages. Bumbershoot is Seattle’s biggest arts festival of the year.Taking over the entirety of the Seattle Center (smack dab in the middle oftown), the event brings in hundreds of thousands of people . With music, comedy, theater and visual arts in everycorner of the vicinity, we defy you to see it all. 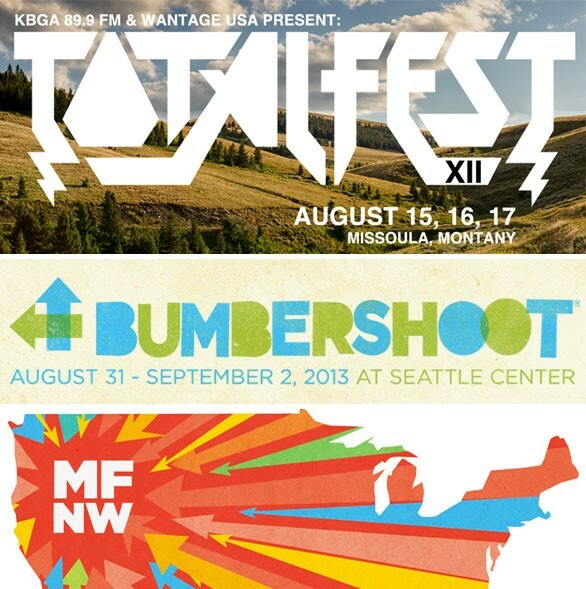 According to the festival’s website Music Fest NW is the third largest indoormusic festival in America. Of course, there will be some outdoor shows too thisyear. If Portlandia has taught us nothing, it's that this is the city cool people congregate (Portlandia star Fred Armisen will even be there). This year the event is a whopping six days. Even making it to one of these days will be worth it.